Stephen Williamson: New Monetarist Economics: The State of the Labor Market in the U.S. The State of the Labor Market in the U.S. 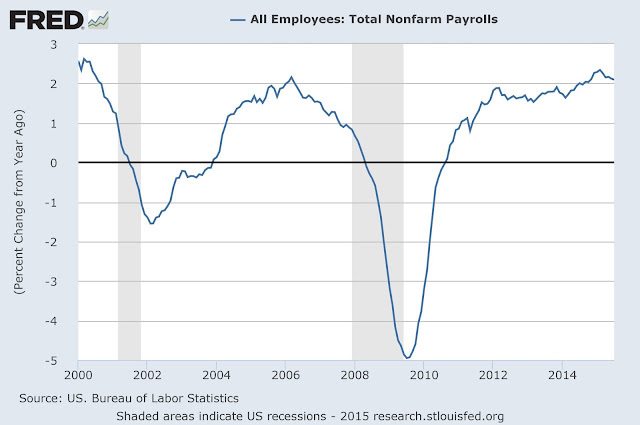 I thought this would be a good time to look at a range of labor market data, to see what we can learn. How does labor market performance look relative to performance before the Great Recession? What's different, and why? As is well-known, the drop in the employment/population ratio, in percentage points, is larger than anything that occurred in the whole post-World War II time series. Further, the large drop in the labor force participation rate, and the fact that labor force participation has continued to fall well after the recession is over, is unusual. Labor force participation appears to typically be driven primarily by long-run factors, so either there was something about the Great Recession that affected participation in an unusual way, or we are just seeing the effects of long run forces here. So, by this measure, the average worker is working more hours per month than at any time since the 2001-2002 recession. This perhaps reflects the pitfalls of taking the CPS data too seriously. As economists we would like good measures of what economic agents are actually doing. In the labor market, we would like to know exactly how labor force participants use their time - how much time is spent searching for a job, what exactly this search entails, how much search employed workers do, how non-participants spend their time, etc. The CPS actually tells us little about what we really want to know. When unemployment is low, as before the recession, most of the unemployed are short-term unemployed - less than 15 weeks. For example, in 2007, it appears that short-term unemployment is about 2/3, and long-term unemployment is about 1/3, of total unemployment. At peak unemployment, following the Great Recession, that situation roughly reversed itself, with about 2/3 of unemployment being long-term. Since then, as you can see in the chart, short term unemployment rates have returned to pre-recession levels or lower. 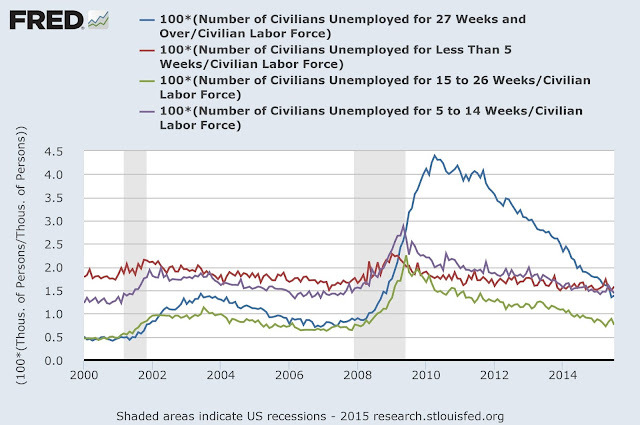 Even the unemployment rate of those unemployed 15-26 weeks is about where it was in 2007. But, though the unemployment rate of those unemployed 27 weeks or more has fallen substantially, this rate is still higher than at any time since 2000. 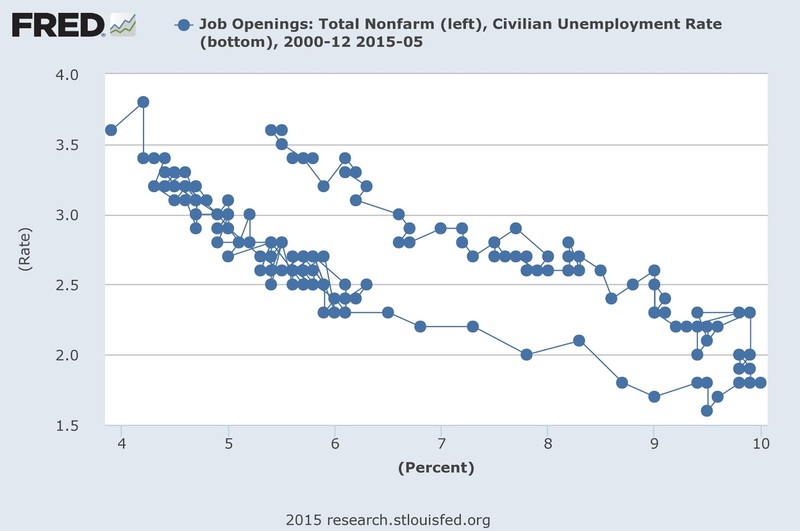 We're interested in the Beveridge curve, in part because the relationship falls out of conventional Mortensen-Pissarides search models of the labor market. In that model, we think of low unemployment and high vacancies as capturing a tight labor market, and high unemployment and low vacancies a slack labor market. In the figure, the line joins points in the scatter plot sequentially in time, moving to the southeast as the recession worsens, then up and toward the northwest as the recovery proceeds. Early in the post-recession period, people were speculating as to whether the rightward shift in the Beveridge curve was due to cyclical factors (the Beveridge curve always shifts rightward in a recession) or some phenomenon related to mismatch in the labor market (the unemployed don't have skills that match well with the posted vacancies). Perhaps surprisingly, the Beveridge curve has not shifted back, with the end of the Great Recession now more than 6 years in the rearview mirror. That would seem to put the kabosh on cyclical explanations for the phenomenon. But it's not clear that mismatch fares any better in explaining the Beveridge curve shift. If that's the explanation, why doesn't the mismatch between the searchers and the searched-for go away? That's quite remarkable, as this measure is at its lowest level in the sample considered in the chart. To receive unemployment insurance (UI), one has to be eligible, and the eligibility requirements include having been sufficiently employed during the recent past. Thus, if I am out of the labor force, and search unsuccessfully for work, I can't collect UI. 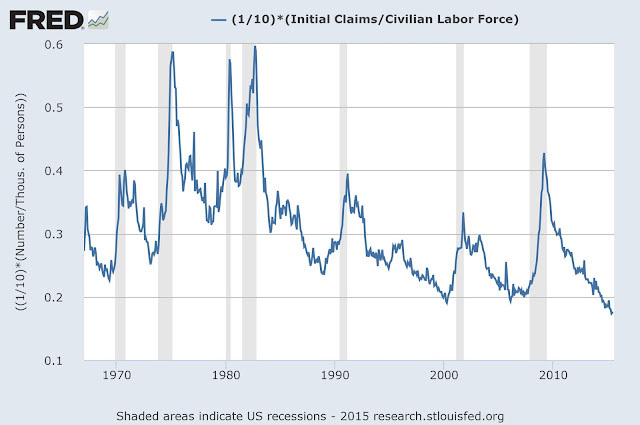 So, initial claims can be missing something, in terms of capturing labor market tightness. Further, the "takeup rate," which is the fraction of eligible unemployed who actually apply for UI, is known to be countercyclical - people tend not to apply for UI if they anticipate that they will get a job soon, for example. But, this works in our favor as, if we're interested in capturing the tightness of the labor market, initial claims will in part reflect forecasts of the unemployed about their probabilities of finding work. As with the initial claims rate, the insured unemployment rate is currently at its lowest level in the whole sample. 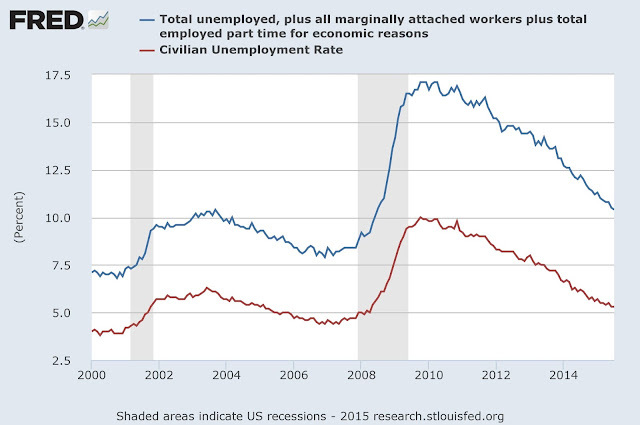 Further, note that before the recession, about 40% of the unemployed were receiving UI, this rose to about 50% at the peak of the recession, and has fallen to about 30%. 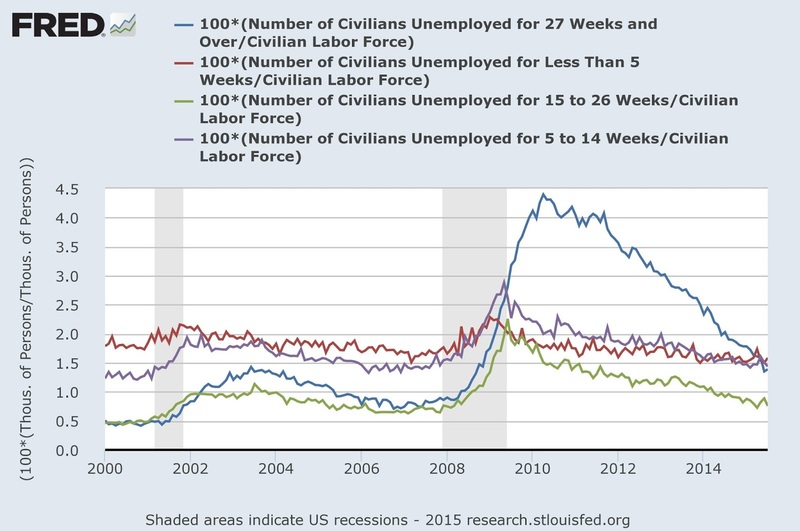 This reflects the relatively large fraction of longer-term unemployed, who typically cannot receive UI for more than 26 weeks. That looks quite stable. Further, currently we're about as far to the northwest in that chart as we have been since the vacancy rate data has been collected, i.e. 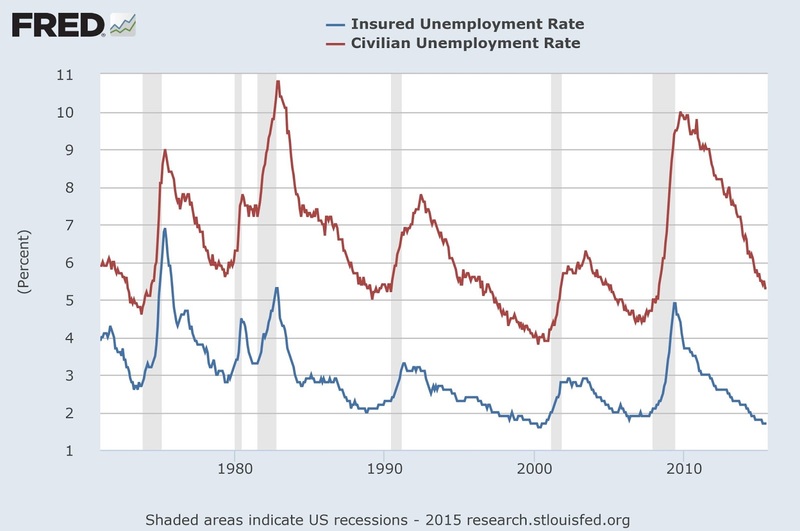 if we measure labor market tightness as the ratio of vacancies to insured unemployed, the labor market is as tight as it's ever been, post-2000. Note here, that the flow into employment from NILF is always larger than the flow from unemployment. Maybe you knew this, but it's news to me. Maybe this comes from thinking too much in terms of Mortensen-Pissarides, where there are only two labor force states (employed and unemployed), and a spell of employment is always preceded by a spell of unemployment. Perhaps people should be thinking more about the NILF state. In any case, both of these rates have returned roughly to where they were before the recession. Before the recession, note that flows to unemployment from NILF and from employment are roughly the same, but this changed with the recession. Currently, more of the flow into unemployment comes from NILF. 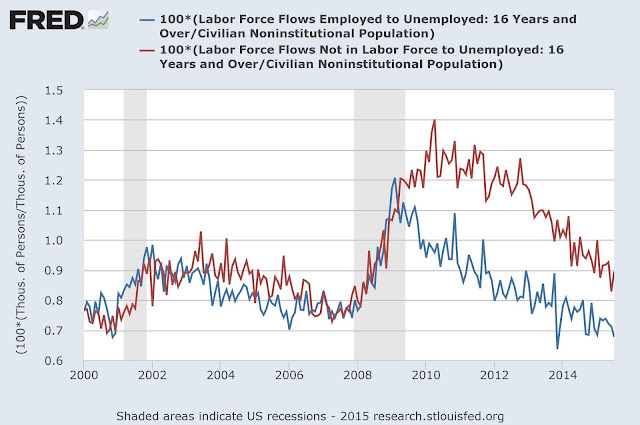 Consistent with what we observed in the initial claims and insured unemployed data, the flow from employment to unemployment is lower than before the recession, and the flow from NILF is higher. This can be interpreted as reflecting a tight labor market - separations from employment are low, and people are entering the labor force to search for work at a high rate. This one is pretty interesting. Note that, before the recession, the flow into NILF directly from employment was typically more than twice the flow from unemployment to NILF. So, in good times, people typically drop out of the labor force due to retirement, illness, for fertility reasons, to go back to school, etc., rather than because they could not find work. 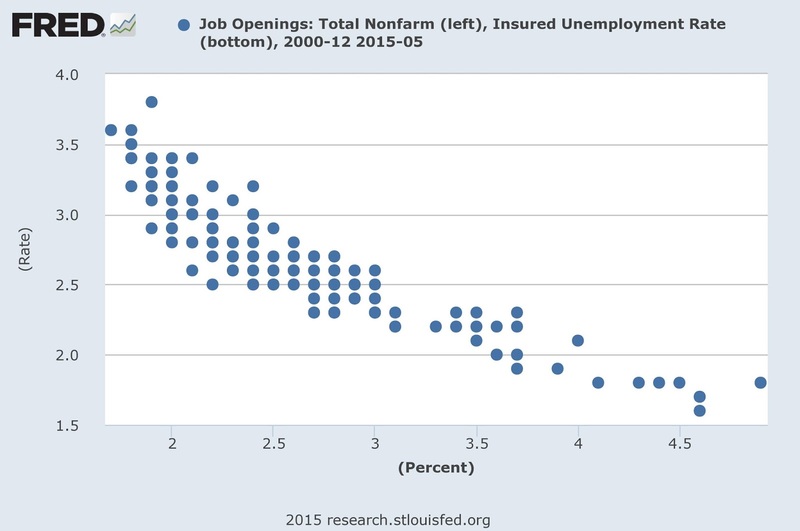 Of course, that changes during the recession, when far more people search for work, then drop out of the labor force. An interesting feature of the data is that, in the Great Recession, in contrast to the 2001-02 recession, the flow from employment to NILF drops instead of increasing. Possibly far fewer people were retiring because of large drops in the value of retirement accounts. While the flow of people from unemployment to NILF remains high - presumably this is the long-term unemployed dropping out of the labor force - the flow to NILF from employment has increased to pre-recession levels. 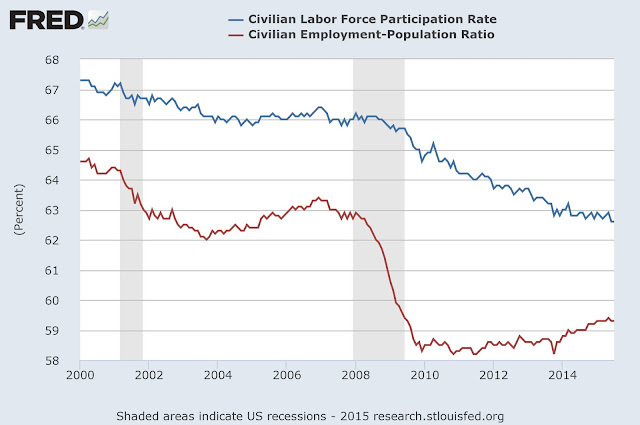 You can see why the labor force participation rate continues to decline (in terms of accounting). Here, the main story is a drop in nominal wage growth from the neighborhood of 3.5% per year before the recession, to the neighborhood of 2% currently. What to make of this? 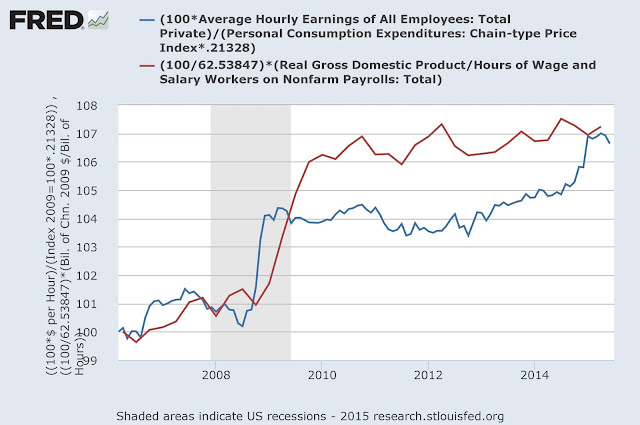 The next chart shows the real wage, measured as average hourly earnings divided by the PCE deflator (headline), and average labor productivity, measured as real GDP per hour of payroll employment. You can see that from the beginning to the end of the sample, wage and productivity growth are almost identical, as standard theory would tell us. 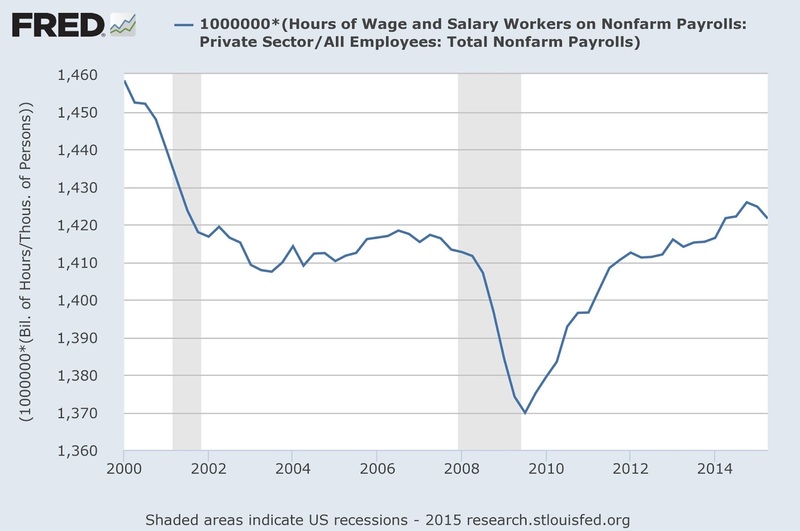 The anomaly here is in the behavior of productivity and wages during the Great Recession. 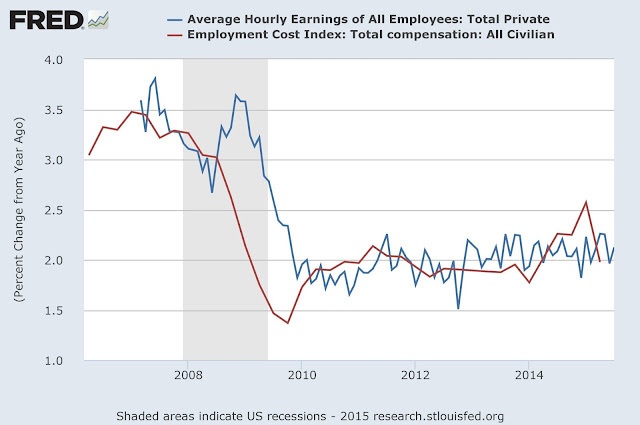 Typically the real wage is acyclical (depending on how you measure it), and average labor productivity is procyclical, but obviously this recession was very different, with large increases in both productivity and real wages. A concern here, of course, is the anemic post-recession growth in productivity. What are the key conclusions we should draw from this? Employment growth is currently strong, and by most measures the labor market is currently somewhat tight to very tight. While labor force participation is low and falling, and there is an unusually large number of long-term unemployed relative to pre-recession times, those observations are tempered by observed flow rates from NILF to the labor force that are comparable to pre-recession times. Given the currently elevated number of long-term unemployed, the unemployment rate could drop much lower than it is now - possibly as low as 4.5-4.8%. The shift is due to long-term unemployed. This explains the stability of the insured rate curve. But I was looking at the Beveridge curve in the 6th chart, and the shift doesn't seem to be going away as the percentage of long-term unemployed declines. So, I'm not so sure. Looking at the insured population doesn't just take out the long-term unemployed - it also takes out the people who transit from NILF to unemployed. In the flow data you can see that the latter is actually the majority of newly unemployed. I would have thought the depth of the prime-age EPOP relastive to 2000 that you didn't show indicates more slack in the labor market than your summation suggests. Of course the decline of the total EPOP reflects aging of the population. "... indicates more slack in the labor market..."
In this case, what do you mean by "slack?" 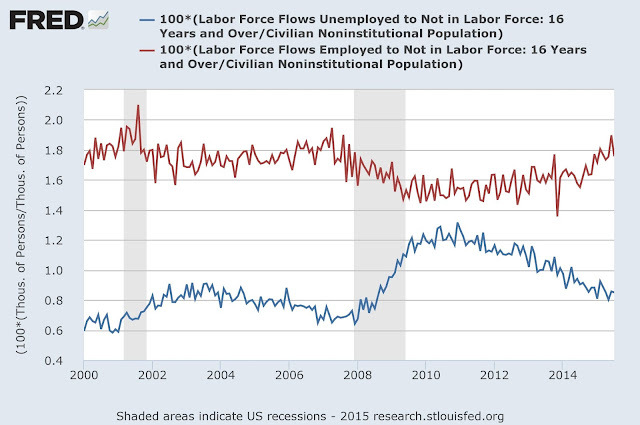 Why would NILF to unemployed flow start increasing right from the start of the recession? Do you take it as a coincidence that the flow rate of unemployed to employed and the flow rate of NILF to unemployed are about the same? (about .9 or have I misunderstood the units?) Is there some equilibrium condition that would be drivig this? You can see in the other chart that most of the flow into employment from other states comes from NILF typically, but that flow fell during the recession. For example, suppose someone who is a student, or caring for children and chooses to enter the labor force. In good times they could go straight from NILF to employment, but in bad times they experience a period of unemployment before finding work, or maybe search for work and then leave the labor force again. "Do you take it as a coincidence..."
Those flow rates seem to move together, but they're not identical. Of course, in a steady state, inflows have to equal outflows for each state: NILF, employed, unemployed. Your observation might have some significance, but I can't think what it is off the top of my head. More people available for work at prevailing wages not reflected in LFP numerator. A.K.A. the involuntarily unemployed. Thanks. I think we think about this in different ways. In the labor market, employment requires that a would-be worker and a firm come to an agreement about an employment contract - a stream of future compensation in exchange for agreed-upon hours of work. The firm would like to have a worker with all of the available skills in the world - a worker who can unplug the toilet, fend off internet hackers, manage many other workers, change the light bulbs, invent new stuff, etc.- Also, the firm would like this worker to put in unlimited hours, and do it for nothing. The would-be worker would like to work zero hours for an enormous salary. Obviously, the would-be workers and firms have to meet somewhere in the middle. What will determine successful matches? On the firm's side, the firm has particular skill requirements that are determined by the available technology. On the would-be worker's side, the worker has particular skills, determined by his or her choices and resources, and he or she has alternatives, determined by social assistance (social security, disability, welfare, UI) and by decisions about fertility and child care, the value of leisure, etc. 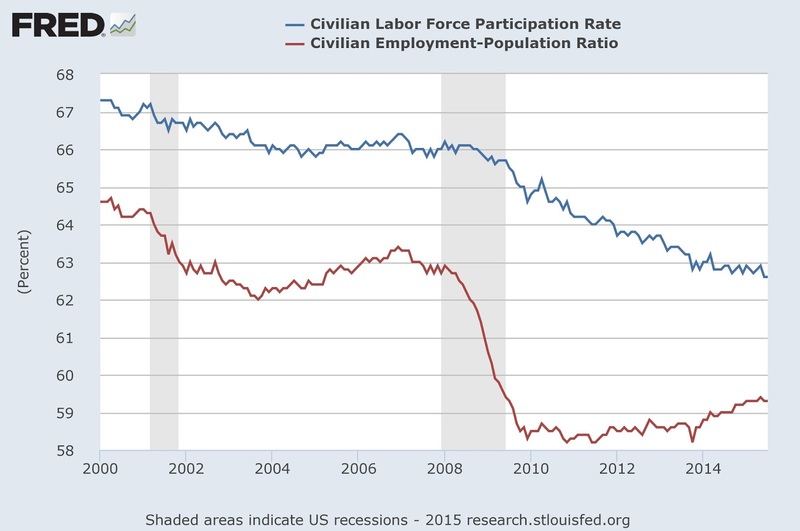 So, in general, I think you're more interested in the labor force participation rate than epop. Labor force participation would be determined by all of the things that I mentioned above. If a would-be worker has skills that have a low value in the market, for example, maybe that person chooses NILF. But there is something else - frictions that might throw sand in the gears, so that would-be workers and firms have trouble coming to an agreement. Some people think that labor market participants get the prices wrong, and it's often argued that this is important. We also might think that a low labor force participation rate reflects underfunding of public education, which leads to underskilled segments of the population which are chronically underemployed. 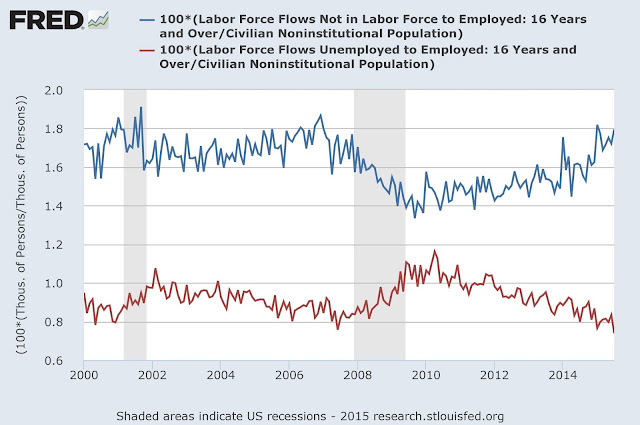 So we can certainly think of inefficiencies that could lead to a low labor force participation rate. What do you think is going on? "Of course the decline of the total EPOP reflects aging of the population." Well of course I don't know what's going on, no sarcasm intended. It just seems obvious that a reduced EPOP for people ordinarily expected to work (prime age in particular) signals inadequate labor demand, due to inadequate consumer (and government) consumption. Maybe the answer is the jobless need to be willing to work for less. Even if that's true, the adjustment period at this point in the business cycle looks interminable, hence policy has been lacking. I wasn't aware of the Canadian counterpart, and it gives pause. You must know everybody and his uncle ascribe falling LFP in part to aging of the population. "It just seems obvious that a reduced EPOP for people ordinarily expected to work (prime age in particular) signals inadequate labor demand, due to inadequate consumer (and government) consumption." This would only be obvious if you think that EPOP can only fall due to "inadequate demand." What I think you mean is that there are sticky wages and prices, and this can lead to inefficiencies in the labor market when there are aggregate shocks to the economy. So, suppose I accept that. Then, there was a large aggregate shock that occurred - the financial crisis - and we are still seeing its effects. But why would wages and prices not adjust to the shock within a seven-year time span? What I see in the labor market is that most features of the labor market have adjusted to the shock - the unemployment rate has fallen substantially, vacancies are high, and most flows look like they did before the crisis. But epop is still low. Thus, it seems to me that we shouldn't be looking for short-run factors - e.g. relative price inefficiencies - to explain what is going on with epop, and with labor force participation. Maybe I could even say this should be obvious. "You must know everybody and his uncle ascribe falling LFP in part to aging of the population." As I like to tell people, we don't do science by taking an opinion poll. If it isn't short term factors, than what could it be that coincidentally took hold after the shock to keep EPOP depressed? Well, notice that epop had already declined somewhat from 2000-2003, then it goes up somewhat during the housing boom. So the incentive-problem-driven housing boom could be masking a long-run trend. You would have to do the empirical work to determine what is important, but as economists we know a lot about the determinants of labor supply - demographics, fertility, social programs, taxation, human capital accumulation, etc. You could speculate, and the Canadian evidence gives you something to go on. Keynesian economics doesn't tell us everything we need to know about the workings of the labor market, right? Right. But that still leaves open the source of the trend change after 2000. Thanks for sticking with this & your replies.